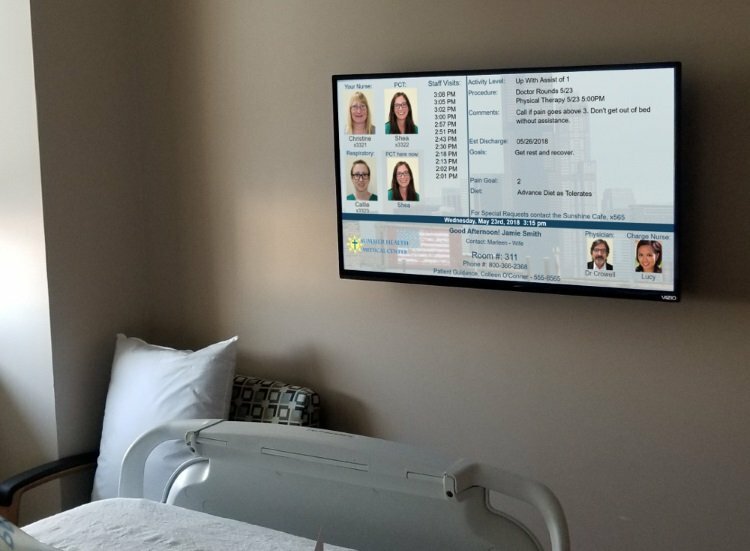 MTR® Digital Patient Room Whiteboards improve patient centered communication, increase patient satisfaction scores, and reduce never-events. Protect your patients, reimbursements, and bottom line. Careteam members can be entirely focused on their patients. We know that updating a marker board is not the most important thing on a nurse's mind when she walks into a room to care for a patient. 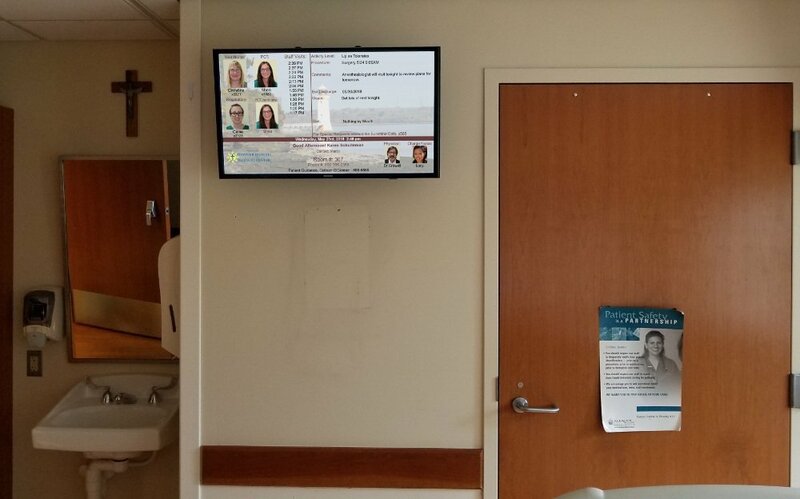 MTR® Digital Patient Room Whiteboards ensure that information is never out of date and patient care remains the top priority. Patients can feel safe knowing that they are not being ignored. 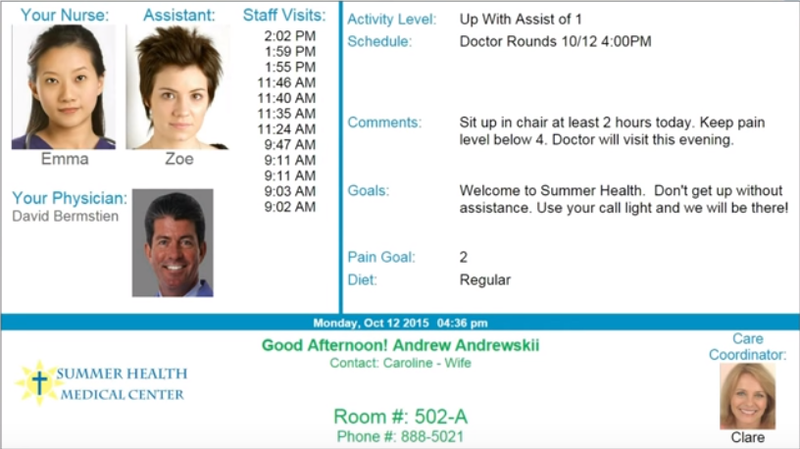 Your patients will always know who is on their care team and what day/date/time it is. 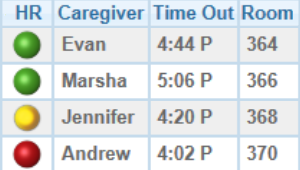 They will know the name, face, and position of the care team member who just walked into their room. They can see diet, plan of care, clinical and safety information, pain goal, and other key information that reduces anxiety, improves outcomes, and helps assure them and their families that the little things are not slipping through the cracks. The MTR® system can easily connect to your hospital's existing electronic medical record (EMR) for easy and reliable communication. Hourly Rounding can be successful. Patients and their loved ones will be assured of the consistency of quality visits by care team members just by glancing at their patient room whiteboard! 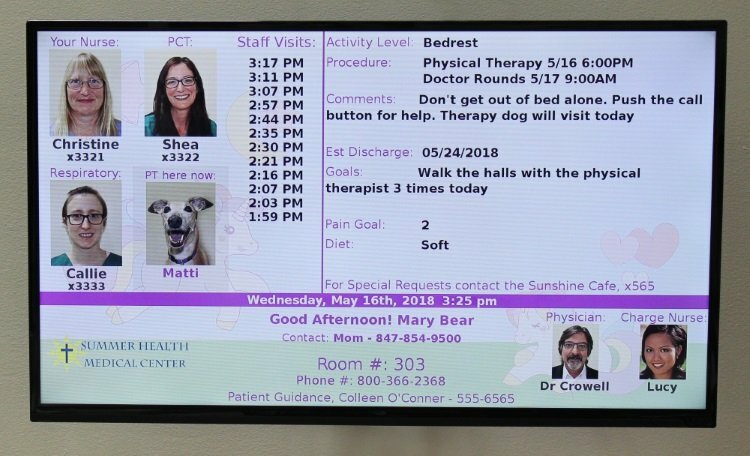 Every time a team member walks into their room, that caregiver's name, face, and position appear on the patient room board, letting patients and families know who is taking care of them. Reduce falls and pressure ulcers with our system's verified results. Patient feedback can look and feel this good. Patients and families have told us that they appreciate the information provided and feel CONFIDENT in quality of care. 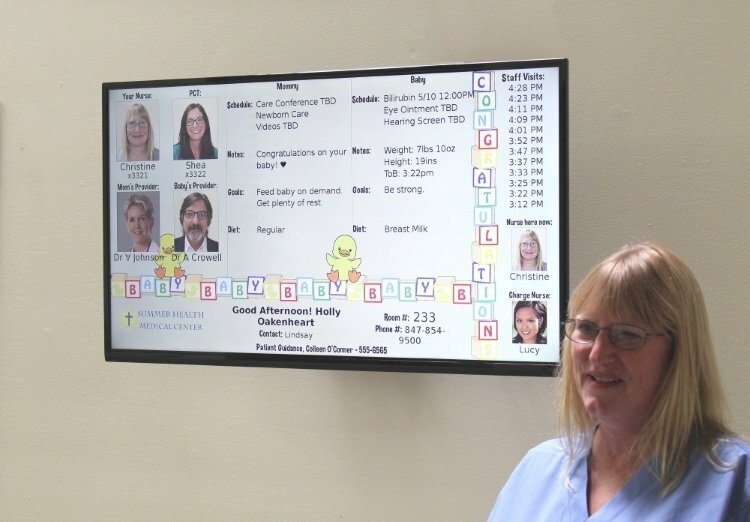 Nurses tell us they are grateful that patients and loved ones know they are being visited regularly and communicated with consistently, and that they no longer have to worry about making sure a dry-erase or magnetic board is correct and up to date. 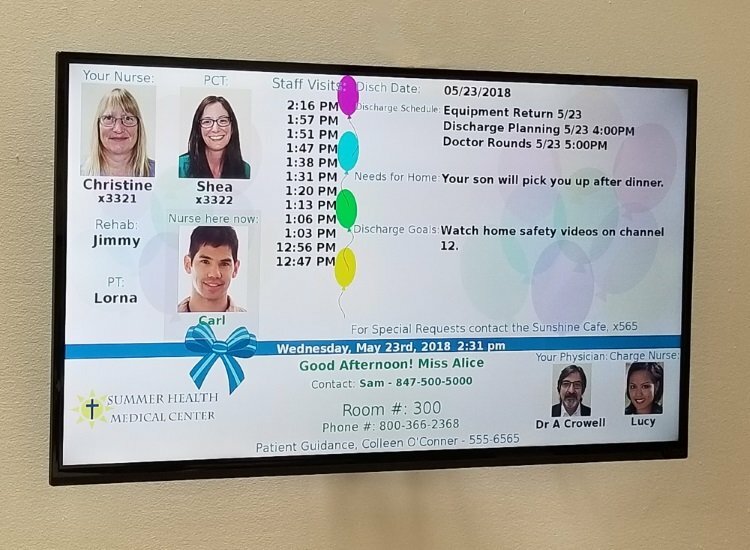 Hospital executives have shared that patients and families have specifically named MTR® Digital Patient Room Whiteboards in their surveys under "Always communicated well". Patients can see and understand what matters to them. 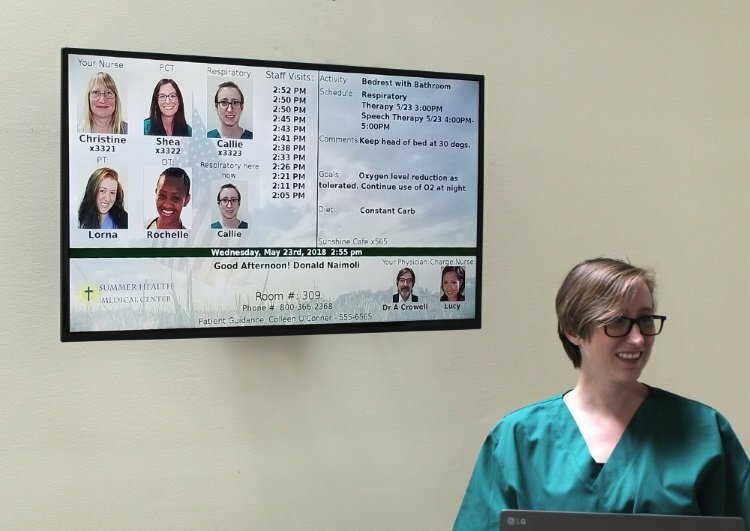 MTR® Digital Patient Room Whiteboards are the only electronic patient room status boards that are totally flexible and completely customizable at hospital, department, and patient levels. Choose the original, customizable and established MTR® Digital Patient Room Whiteboards for your patients because they are proven to improve patient-centered care, and your patients deserve the best. Start reducing never-events; increasing quality Patient Satisfaction Surveys; and, most importantly, improving patient experience TODAY.